Edited by Mother Tereza, 01 July 2015 - 08:08 AM. Renamed; Original Title: "Shuffle slots"
If we talk about an option, it makes sense. Ofcourse this is kinda of a big deal so we should give the chance to have it or not,especially if your scrimming with some team etc. This sounds great, and ive mentioned a few times that i wish it was a thing. People complain from time to time about lobbies being stacked with new players on one team and experienced players on another. My suggestion: Option to mix the teams randomly for lobbies. You just choose your class rather than team, and after the ready up process finishes the teams are mixed randomly. Edited by Mother Tereza, 20 November 2015 - 01:52 PM. We called it AL. It was a bummer. ALs were consistently a much better lobby experience, I found. The balancing was a bit dodgy at times but it was a marked improvement. But on this suggestion, nah. It's just another reason why ALs won't be as special. People don't play AL anymore because it takes more time I guess. Implementing the scramble option to normal lobbies would be pretty cool. 32.2 hrs last 2 weeks. 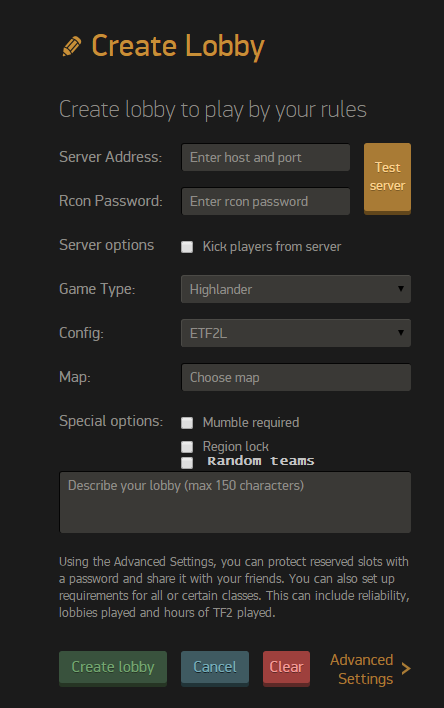 So the idea is to add this option in the create lobby menu and make it a checkbox similar to the "kick players from server" and "mumble required". If this option is checked, it will create a lobby with grey teams that will be later made by your algorithm exactly as AL. Lobbies with this option active should be marked in the homepage with a small icon like the mumble ones. Will this stuff require too much work or is implementable? Edited by Mother Tereza, 20 November 2015 - 01:48 PM. If all lobbies scrambled, why would we need advanced lobbies? The purpose of this idea is not to make all lobbies scrambled, we're talking about an option to let lobby leaders choose between scrambled and regular lobbies. I can see a big potential in this idea. Perhaps, although it would really take away from the most interesting part of AL. But it would be interesting in normal lobbies. 21 hrs last 2 weeks. Thats just Advanced Lobbies with no mumble! But im for it because its avoid stacked lobbies. Instead of doing the full balancing you could just have regular lobbies have a setting to do a random scramble. Advanced lobbies get the balancing from tpr and regular lobbies just get randomized. I don't see what advantages a random system has that the ALs-like doesn't. In both cases u can't stack and u can potentially play vs friends, but the 2nd system at least makes the lobby as fair as possible. Whoa whoa, dont get ahead of yourself.